Typically, you wouldn’t think running and chocolate would go together – but the geniuses at RAM Racing thought they should, and it couldn’t have been a better idea. It’s a 15K and 5K. Last year, I did the 15K with a group and it immediately became my favorite race. Now last year, it was about 60 degrees (don’t forget, this is a January race) and this year it was about 40 degrees at start time. Luckily, that was a heat wave here compared to the past few weeks. I did the 5K this year and, despite the pain in my cold fingers, it was just as much fun. Totally worth getting up at 5am and running 3 miles to get a plastic mug full of hot chocolate and chocolate fondue with marshmallow, banana, wafers, pretzels, and a rice krispie treat for dippin. Oh and you get a really awesome performance hoodie. AND part of the proceeds from the race help support the Atlanta Ronald McDonald House, where I’ve been volunteering for a little over a month now! 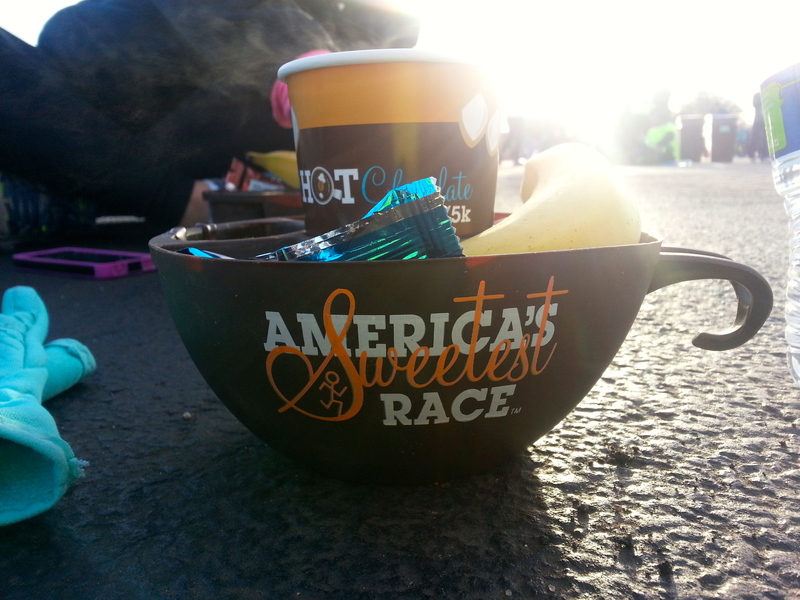 Sweet swag + running + chocolate = win. Oh – and count it! I’m making some good progress on the 30 Before 30 list! Categories: Wonderful Wednesday | Tags: 30 before 30, hot chocolate, running | Permalink.